Denice Frohman is an award-winning poet, educator, and performer from New York City. 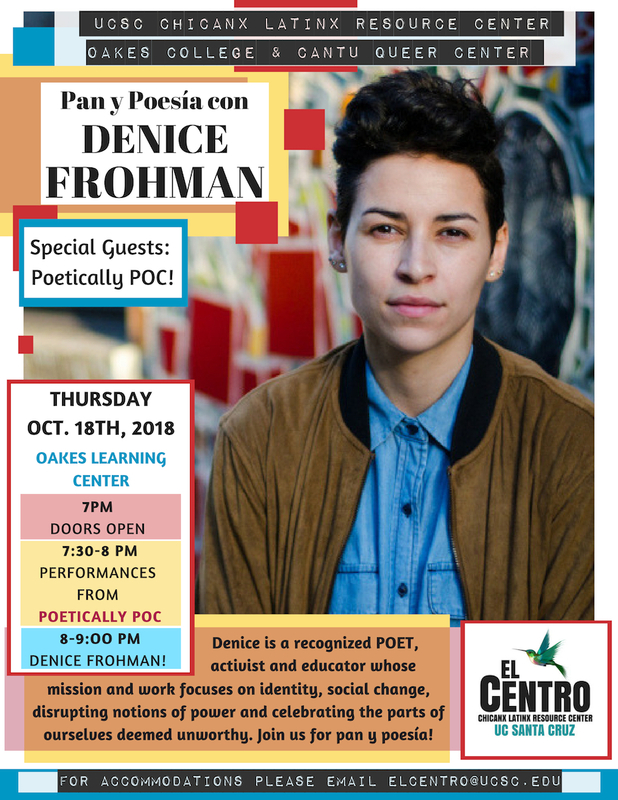 She is a CantoMundo Fellow, former Women of the World Poetry Slam Champion, and National Association of Latino Arts & Cultures grant recipient. Her work has been commissioned by The Metropolitan Museum of Art, ESPN and Twitter; has appeared or is forthcoming in The Acentos Review, Nepantla: An Anthology Dedicated to Queer Poets of Color, Women of Resistance: Poems for a New Feminism, and garnered over 10 million views online. She has been featured at over 200 colleges and universities; hundreds of high schools, nonprofits, and cultural arts spaces; and performed at The White House in 2016. She has a Master’s in Education and is passionate about working with young people. Currently, she tours the country. Poetically PoC was created to provide poets/closet poets of color the space to create, share, and workshop their poetry in the midst of existing in an institution not built for us. We exist to support students of color who have an interest in writing but felt discouraged perhaps through unmotivated educators and lack of representation in literature course material. We are here and through our writing we work to heal and preserve ourselves and our communities.